Alfie is the first “rescue” dog that we have had. However, to be truthful, as a child, all my dogs were strays and always had “problems”. On the day that the owner brought Alfie to our house, her choice; not ours, she shared with us that she worked twelve hour days and had four more standard poodles and three toy poodles beside our Alf. When she went to work she locked the dogs in a spare bedroom. She also mentioned that he had been placed with a man and his wife, and for some reason Alf had ended up crated and living in the garage. The man returned Alfie to her. It was no surprise then that Alfie was very clingy to his old mistress and whined and barked when she left. (For later reference the owner was blond and drove a white car.) When he accepted she was no longer with us, he turned his attention to my wife and has clung to her since then. However, he has been a little more adventurous with each passing day. Since my wife had promised to walk a neighbors dog while the neighbor recovered from knee surgery, I was tasked with walking Alfie. It was obvious that several people had tried to work with Alfie, but in his training his was not consistent. Although he wanted to pull, it wasn’t with force; and it wasn’t the charge to the end of the lead that our previous poodles had used before their training. When corrected for pulling with a pop on his lead, Alfie would turn come back to my left side and wait. As soon as I started again, he went to the end of the lead. Sometimes he would stop at the end of the lead; sometimes he would circle around to my right side. He responded to stay, but momentarily. It was apparent that this was going to be tricky, and I would need to let Alfie teach me what he knew first. The third day we had to both leave because of a tax appointment with our accountant. We figured that he would be ok for a couple of hours. Boy, were we wrong. We returned to find my wife’s clothes from the hall closet along with his harness and leash strewn around the living room and dining room. He had dragged down a bag of treats and destroyed them. He had managed to get our bedroom door open and my wife’s closet door open. He had dragged her clothes and shoes from the closet and strewn them around the bedroom. He left us a definite message because he had urinated in several spots around the house. All this in less than two hours. OK, message received. The separation anxiety and the focus on my wife were going to be our biggest rehabilitation issues and would need to be addressed before serious training began. We decided that we would take turns leaving and returning to the house in our natural routine except that someone would always be there. The person staying would ignore his crying and barking. It soon became clear that I could come and go with no problem, but that it was my wife that threw him into a panic attack. He was anxious when both of us were not with him and would search for the missing person. Alfie and my walks were going well. He was friendly and eager to meet most people but would then bark and back away if it was a man. I soon noticed that a sight of a white car would excite him. He also became excited when he saw a woman, particularly a blond. When he met other dogs on our walks he was eager to greet them. They did their doggie thing, and we went on our way. I walked him in the morning and my wife walked him while I tagged along in the evening. We notice that he was much more relaxed on the evening walk, and by the third night his tail was up and wagging on his walk. The rest of the week was spent establishing a routine working on lessening his fixation on my wife. By the end of the week, he was still following her wherever she went but not in a panicked state. Race is a red herring. This is about police rules of engagement. There seems to be the rule of “shoot first; ask questions later”. We had two standard poodles, Fletchie and Alfie. Fletchie, our white poodle, we lost a year ago. Alfie, our black poodle, we lost this past July. The loss of Alfie was particularly difficult as all our affection was directed towards him after Fletchie’s death. Also, Alfie was very social and could and did go everywhere with us. He went to, the grocery store, Walmart, the gas station, StarBucks, and Home Depot. (He even had his own orange Home Depot apron.) This is partially why I haven’t been blogging recently. My wife took his loss even harder. So, about a month ago, someone posted on our community bulletin board they had three standard poodles they had to get rid of or send to poodle rescue. They were three years old. We debated and debated and finally decided we would go see these three year old dogs. 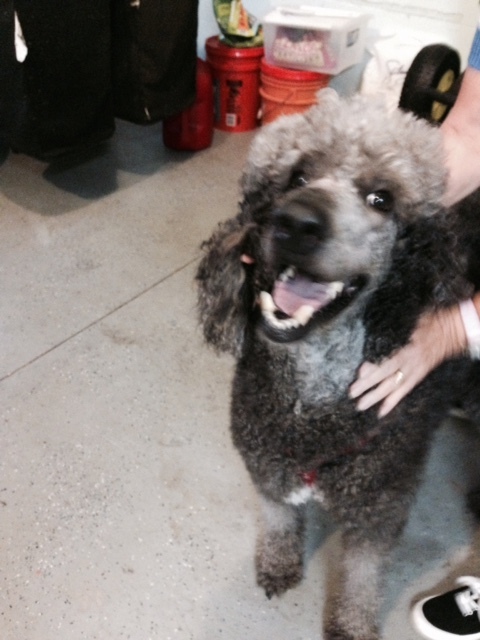 The owner brought out the three poodles, two males and one female. Immediately the black poodle ran over and started kissing on my wife. He wouldn’t let either of the other dogs near her. Obviously my wife liked the black poodle. It was decided; the black poodle was going home with us. So, I asked the owner what the black dog’s name was. “He’s Alfie.” she said. I think our hearts skipped a beat. The owner could see our response and asked what was the matter. We told her our last black standard poodle’s name was Alfie. We’ve had Alfie for almost two weeks now, and he already is part of the family. I will relate his continuing story later. Here is his picture.